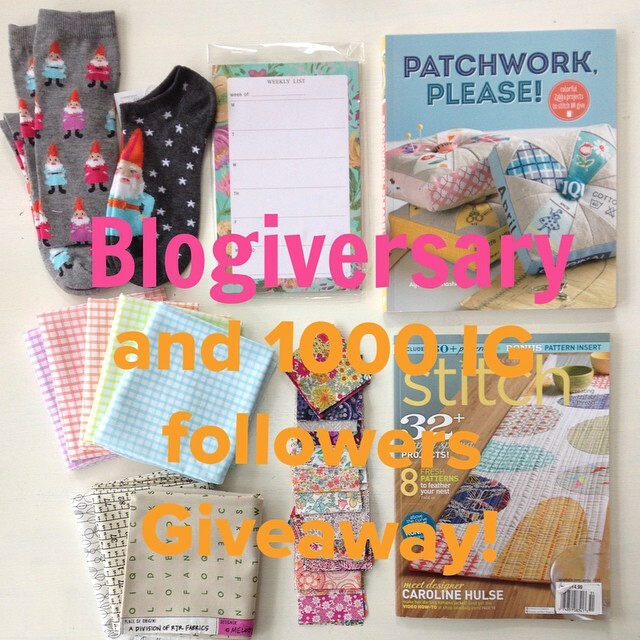 Today I'm celebrating my 4 Year Blogiversary and 1000 followers on Instagram with a fun giveaway! You could win two pairs of gnome socks (knee and low cut), a Bari J weekly task pad, a copy of Ayumi's amazing book Patchwork Please, a low volume/texty fat quarter bundle, 100+ 2.5" mini charms in Liberty of London Tana Lawn and the latest issue of stitch magazine! To enter just leave a comment and tell me how you follow (if your email address is not linked to your profile, you better add that too), and/or comment/follow on IG. Best of luck. I'll pick a winner later this week. Thank you all for following me all these years, or just recently, and for continuing to keep up when the posts have been few and far between! Congratulations Courtney - wow 4 years is great. I have you in a list of regular reads, and I follow you on IG via the internet. Thanks for the chance to win such a fabulous package. Congrats, as well. I follow your blog in bloglovin. Congrats on 4 years!! I follow you on Flickr, but I just signed up for your blog! Congrats! I follow you via Bloglovin' and on IG. Congrats! I have been happily following with bloglovin. Big accomplishment!! I follow on Flickr. Thanks for a lovely giveaway. I follow on bloglovin! Love the giveaway and congrats on the 4 yrs! Congrats! I follow on feedly! Happy blogiversary! I'm a follower with Bloglovin'. Thanks. follow you on email and blogovin. thank you for the tutorials. Happy Blogiversary and thank you so much for your wonderful giveaway. I follow you via GFC. Thanks for the great giveaways! would love to win ! Happy Anniversary! I am a new follower via email and Instagram (cher277). Have a great day! I follow on Bloglovin! Thank you for the giveaway! Congrats!! Great prizes and I'd love to win this prize pack!! I follow you on Bloglovin and IG!!! I follow mon petit lyons on bloglovin. Congratulations! I follow using LiveBookmarks on Firefox. Congrats! I follow on bloglovin'. Thanks for a chance to win! Happy happy Blogiversary! 4 years in the blogging world is definitely worth celebrating! I am a new Bloglovin' follower and look forward to reading your posts. Happy anniversary! Thanks for the chance to win. I follow on instagram. Congratulations on reaching this milestone!! I follow through GFC! Thanks for the fun giveaway!! Congratulations! I am following you on bloglovin. Happy Blogaversary Courtney! We should be giving you gifts! Thanks for this generous, beautifully curated giveaway. And thanks for your lovely blog. I love your colorbrick quilts. I'm a follower on Bloglovin. Many congratulations - I love your blog and follow on Bloglovin! Congratulations! I'd love to win! Happy Blogiversary! I'm following on IG. Congrats! I follow on bloglovin. Happy 4th anniversary. I follow on BL. Will you celebrate? How many blogs is that? Happy anniversary! I follow by email. Congrats!! I love your blog and follow via bloglovin and email. Thanks for the chance to win some great prizes. I happily follow on Bloglovin! Happy anniversary,, I always enjoy reading your blog. I follow by email. Happy Bloggyversary! I follow by email. Fun prizes! Yeah, for you! Congratulations. I follow through email. Congrats of 4 years! Your blog is one of my very favorite places to go. Thanks for your effort in make it such a great place! I follow you on blogger. Happy Blogiversary! I follow you by email! Happy 4th to you!! I follow you by email! I follow you by email and read your blog. i follow via email. Congratulations on your success. Thanks for all the inspiration. Congratulations! I follow you by email and IG too! I love IG it is very informative and downright fun! what a generous giveaway! i follow your blog via email. happy blogiversary! I follow via GFC. Actually, just signed up to follow even though I've been reading for a while. I follow via e-mail, Congratulations on the mile stones and Thank you for the giveaway. Hello! I already follow with Bloglovin. Your giveaway can be found at: http://www.missourimel.com/giveawayroundup. Happy Blogoversary!! A huge congratulations. I follow by email. What a wonderful give a way. Those socks are to die for. Thanks for a chance. Stay warm. Congrats! I follow you with Bloglovin. Thanks! Congratulations! I follow you via Bloglovin. So, how many comments do you expect then with 1000 followers and such great prices?! Anyway, happy blogiversary to you and thanks for all the inspiration for us readers! P.S. I follow your blog via Bloglovin and have actually no idea if you can see my email address, but in case you can't, it's guanako01 at hotmail dot com. I follow on feedly! Congrats! I am new to quilting and would love to win this giveaway. Congratulations on 4 yrs! I follow via email notification as well as on Bloglovin'. I follow via e-mail. Love your tutorials. Thanks for the generous giveaway. Congratulations! I'm a new follower but fingers crossed I'll win as I love those gnome socks! 4 years is awesome, congrats! I just started following you on Bloglovin and IG and I look forward to reading your blog. Thanks for the amazing giveaway. hello, I don't really follow your blog. I don't want to insult you or anything, I don't get online so often to really follow anyone. I just saw that you were giving away fabric and decided to try and win. I need fabric because I have no job, though I've applied to plenty places no one will hire me ( and It's not because I'm not good or have a record, GOD just hasn't blessed me with one yet). I'll understand if you refuse to allow me to join the giveaway, it would seem unfair for someone not following all the rules to win, but I will still hope and pray that you'll allow me to have at least a chance. have a great day! : ) (PS: my email is: Theartististhepoet@yahoo.com) Thank you! Congrats to you, Courtney! I wish I would have run into you at QuiltCon. Love your work! Congratulations on four years! I follow via Feedly.